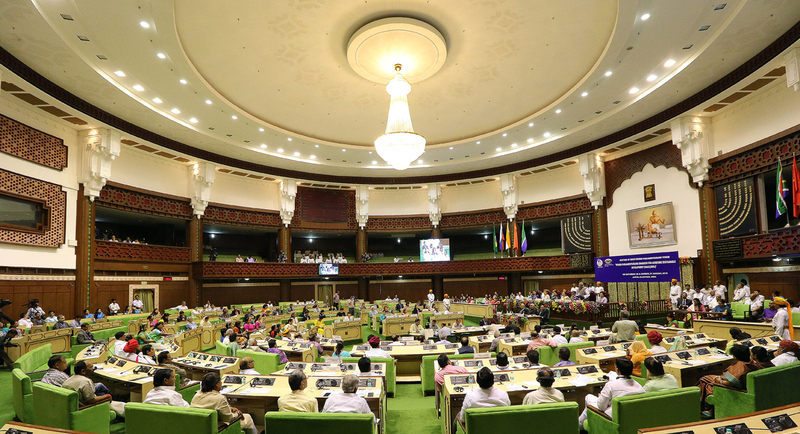 Women Parliamentarians Forum in Jaipur, India. Russian delegates proposed an entrepreneurship support programme for women at the recent BRICS Women Parliamentarian Forum, held in the Indian city of Jaipur. The Speaker of the Indian Parliament, Sumitra Mahajan, inaugurated the two-day conference on August 20. The BRICS (Brazil, Russia, India, China, South Africa) Women Parliamentarians Forum, held in the Indian city of Jaipur (200 kms from New Delhi) on August 20 and 21, saw the Russian delegation initiating a proposal to develop an entrepreneurship support programme for women, said Galina Karelova, head of the Russian delegation at the forum and deputy chairperson of the Federation Council. "The Russian delegation has initiated a development programme to support women entrepreneurs in the framework of the BRICS. Russia has already prepared a draft programme that will be submitted to the Federation Council in September. We offered our colleagues a draft to create a similar programme for BRICS" the TASS news agency quoted Karelova as saying. She noted that among other issues discussed at the forum, much attention was paid to the issue of women's participation in environmental protection and the fight against climate change. "Women as mothers are particularly concerned about the negative effects which climate change brings. The forum delegates called for greater involvement of women in the BRICS initiatives on environmental protection." The meeting of women delegates from the five BRICS countries at the forum in Jaipur also decided to develop a programme to support participation of women in the most advanced technological fields. "The purpose of that programme is to help women master high technology. The forum called for the BRICS member countries to help ensure access for women from less developed countries to the most modern technologies," said Karelova. She said the adopted declaration also expressed the willingness to strengthen cooperation in the development and implementation of innovative ideas for sustainable development of the BRICS member countries. A total of 42 women from the five member countries attended the forum, including five women parliamentarians from Brazil, three from Russia, 28 from India, two from China and four from South Africa. The theme for their discussions was ‘Perspectives on implementation of SDGs’ (sustainable development goals). India will chair the BRICS summit in Goa in mid-October. BRICS is an informal inter-state association of Brazil, Russia, India, China and South Africa.